Ten immortal masterpieces that tower over all the rest. There has been a great deal of nonsense written about this rather ordinary painting. It occupies a place among the "ten greatest" only because of its high popular recognitionit is the best-known painting in the world. 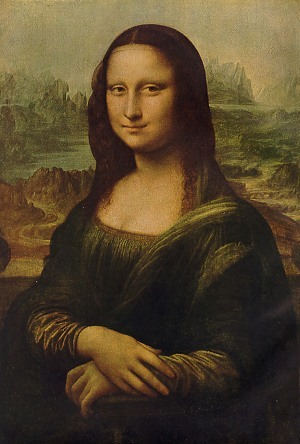 Yes, Da Vinci's picture had a strong influence on the artists of the Renaissance (test #2) and, yes, the hands are beautifully modeled and there is a certain dreamy charm here, but we are forced to say that Mona Lisa utterly fails test #4. There is simply no reality herethe painting does not evoke the aura of a living human being. I don't mean to upset those who love this pictureI know there are many who hold it in very high regard. After all, Mona Lisa is the number one tourist attraction in the City of Paris, perhaps the principal travelers' attraction in all of Europe. The millions who stand in line at the Louvre for a quick glimpse of this famous beauty are attracted mostly, I suspect, by her sheer unparalleled celebrity. We portrait painters find few lessons to learn in the glacial refinement of her contours and the fairytale quality of the background. What did she really look like?